This article is about the film. For the software concept, see Source code. For "source coding", see Data compression. Source Code is a 2011 science-fiction action thriller film directed by Duncan Jones and written by Ben Ripley. It stars Jake Gyllenhaal as a U.S. Army captain who is sent into a computed reality to find a bomber. Michelle Monaghan, Vera Farmiga, and Jeffrey Wright play supporting roles. The film had its world premiere on March 11, 2011 at South by Southwest, and was released by Summit Entertainment on April 1, 2011 in North America and Europe. The film received favorable reviews from critics and became a box office success, grossing over $147.3 million worldwide. Plans for a television adaptation at CBS were announced shortly after the film was released. However, these plans were scrapped in December 2014 in favor of a film sequel. The sequel is in development with Mark Gordon returning as producer and Anna Foerster added as director. U.S. Army pilot Captain Colter Stevens wakes up on a Metra commuter train headed to Chicago. Stevens is disoriented, his last memory was flying on a mission in Afghanistan. However, to the world around him – including his friend Christina Warren and his reflections in the passenger window and in the restroom mirror – he appears to be Sean Fentress, a school teacher. As he expresses his confusion to Christina, the train explodes, killing everyone aboard. Stevens regains consciousness inside a dimly lit cockpit. Communicating through a video screen, Air Force Captain Colleen Goodwin verifies Stevens' identity and tells him of his mission to find the train bomber before sending him back to the beginning. Believing he is being tested in a simulation, Stevens finds the bomb, but is unable to identify the bomber before the train explodes again. Stevens reawakens in his capsule and, after demanding to be briefed, learns that the train explosion actually happened, and that it was the first attack of a series. He is sent back again, eight minutes before the explosion, to identify the bomber. This time, he disembarks the train (with Christina) before it explodes to follow a suspect, but is killed by a freight train when he falls on the tracks. Noteworthily, Stevens survived for more than eight minutes, since he witnessed the explosion, while Christina did not die at all in the simulation. The capsule power supply malfunctions as Stevens reawakens, likely due to being in the “simulation” longer than its eight-minute stream. He claims to have saved Christina, but is told by Dr. Rutledge that she was saved only inside the “Source Code”, an experimental machine that enables someone to take control of a compatible person’s body in a parallel reality eight minutes before their death. Thus, Christina is still officially reported killed in their original timeline. With the second attack imminent, Stevens repeatedly re-enters the Source Code to find the bomber. On one occasion, he attempts to contact Rutledge using a cell phone to show that the past can be changed. But since he called in a different reality, “it [was] received by a different Rutledge entirely”; the continuum of the original reality cannot be altered. Furthermore, Stevens also learns that he has been with them for two months since being reported killed in action. He is actually comatose, missing most of his body, and on life support while hooked up to neural sensors. The cockpit capsule is a manifestation, as his mind attempts to make sense of its environment. Angry at his forced imprisonment, Stevens asks to be terminated after the mission and Rutledge accepts. Eventually, Stevens catches the bomber, an anarchist named Derek Frost. Stevens memorizes Frost’s license and vehicle registration plates but is unable to stop the train explosion. The police in the original reality subsequently arrest Frost, preventing the second attack. Stevens is congratulated for completing his mission, but requests to go back in the Source Code to stop the train bombing despite Rutledge insisting “it doesn’t work that way”. While the other workers celebrate, Goodwin sends Stevens back one last time, promising to disconnect his life support at the end of the eight-minute stream. This time, he sets a date with Christina, defuses the bomb, handcuffs Frost, and reports him to the police. He then emails Goodwin a coded message and then calls his father, reconciling with him under the guise of a fellow soldier. Meanwhile, Rutledge breaks his promise and orders Goodwin to wipe Stevens’ memory for a future mission. Goodwin disobeys and terminates Stevens’ life support precisely when the Source Code stream ends. Stevens and Christina kiss, and their alternate-reality universe continues. They are seen happily walking through downtown Chicago to the Cloud Gate, where Stevens experiences déjà vu, as every time he exited the Source Code, he had visions / “vivid dreams” of himself and Christina at the Cloud Gate, which prompts him to question whether this was his fate. The alternate-reality-Goodwin receives the coded email from Stevens as she arrives to work in the morning, informing her how they have changed history, as well as the true capabilities of Source Code, and a request to help the alternate-reality version of him that is still in a coma. Ripley first came up with the idea for Source Code, in which government operative Colter Stevens repeatedly relives the eight minutes leading up to a terrorist train bombing in hopes of finding the bomber, he had no intention of writing it on spec. Having established himself in Hollywood largely doing "studio rewrites on horror movies," he felt a solid pitch would do the trick. Unfortunately, it didn't. "I sat down with a few producers, and the first couple just looked at me like I was nuts," confesses Ripley. "Ultimately, I had to put it on the page to make my case." After seeing Moon, Gyllenhaal lobbied for Jones to direct Source Code; Jones liked the fast-paced script; as he later said: "There were all sorts of challenges and puzzles and I kind of like solving puzzles, so it was kind of fun for me to work out how to achieve all these difficult things that were set up in the script." In the ending scene, Jake Gyllenhaal's and Michelle Monaghan's characters are seen walking through Millennium Park, and make their way to the Cloud Gate. In a 2011 interview, Gyllenhaal discussed how director Duncan Jones felt the structure was a metaphor for the movie's subject matter, and aimed for it to feature at the beginning and end of the movie. Principal photography began on March 1, 2010, in Montreal, Quebec, and ended on April 29, 2010. Several scenes were shot in Chicago, Illinois, specifically at Millennium Park and the Main Building at the Illinois Institute of Technology, although the sign showing the name of the latter, in the intersection of 31st Street and S LaSalle Street, was edited out. Initially, some filming was scheduled at the Ottawa Train Station in Ottawa, Ontario, but was cancelled for lack of an agreement with VIA Rail. Editing took place in Los Angeles. In July 2010, the film was in the visual effects stage of post-production. Most of the VFX work was handled by Montreal studios, including Modus FX, Rodeo FX, Oblique FX, and Fly Studio. Jones had confirmed that the film's soundtrack would be composed by Clint Mansell, in his second collaboration with the composer. However, it was later announced that Mansell would no longer score the soundtrack due to time constraints. The film received its world premiere at South by Southwest on March 11, 2011. Summit Entertainment released the film to theaters in the United States and Canada on April 1, 2011. In France, the film was released on April 20, 2011. Source Code was released on DVD and Blu-ray simultaneously in the United States on July 26, 2011, with the United Kingdom release on DVD and Blu-ray (as well as a combined DVD/Blu-ray package) on August 15, 2011. In the UK, there was also a DVD released featuring a 3D cover. 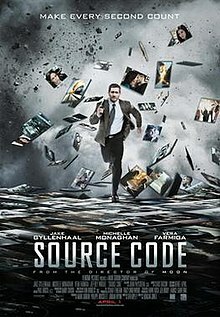 Source Code was released in theaters on April 1, 2011. In the United States and Canada, Source Code was released theatrically in 2,961 conventional theaters. The film grossed $54,712,227 during its run with midnight screenings in 2,961 locations. Overall the film made $14,812,094 and debuted at #2 on its opening weekend. Source Code received acclaim from critics. Review aggregator website Rotten Tomatoes reports a 91% approval rating, based on an aggregation of 247 reviews, with an average rating of 7.5/10. The site's consensus reads, "Finding the human story amidst the action, director Duncan Jones and charming Jake Gyllenhaal craft a smart, satisfying sci-fi thriller." Metacritic awarded the film an average score of 74/100, based on 41 reviews, indicating "generally favorable reviews". Critics have compared Source Code with both the 1993 film Groundhog Day, and British film director Tony Scott's 2006 time-altering science fiction film Déjà Vu: in the latter case, the similarity of plotline in the protagonist's determination to change the past was highlighted, and his emotional commitment to save the victim, rather than simply try to discover the identity of the perpetrator of the crime. Alternatively, it has been described as a "cross between Groundhog Day and Murder on the Orient Express," while The Arizona Republic film critic Bill Goodykoontz says that comparing Source Code to Groundhog Day is doing a disservice to Source Code's enthralling "mind game." Richard Roeper of the Chicago Sun-Times called the film, "Confounding, exhilarating, challenging – and the best movie I've seen so far in 2011." Roger Ebert gave the film 3.5 stars out of 4, calling it "an ingenious thriller" where "you forgive the preposterous because it takes you to the perplexing." Kenneth Turan of the Los Angeles Times called Ben Ripley's script "cleverly constructed" and a film "crisply directed by Duncan Jones." He also praised the "cast with the determination and ability to really sell its story." CNN called Ripley's script "ingenious" and the film "as authoritative an exercise in fractured storytelling as Christopher Nolan's Memento." He also commented that Gyllenhaal is "more compelling here than he's been in a long time." ^ a b "Source Code". British Film Institute. Retrieved April 29, 2014. ^ Kaufman, Amy (March 31, 2011). "Movie Projector: "Hop" will jump over rivals this weekend". Los Angeles Times. Retrieved April 1, 2011. ^ a b "Source Code (2011)". Box Office Mojo. Retrieved May 14, 2012. ^ "Source Code (2011) - Duncan Jones". AllMovie. ^ "SOURCE CODE". British Board of Film Classification. ^ Fernandez, Jay A. (December 16, 2010). "'Moon' Director Duncan Jones Returns to SXSW With 'Source Code'". The Hollywood Reporter. Retrieved June 6, 2011. ^ a b c "Source Code (2011)". Rotten Tomatoes. Retrieved August 18, 2011. ^ Wronski, Richard (March 9, 2011). "Compared to Metra train's movie fate, delays look tame". Chicago Tribune. Retrieved June 5, 2014. ^ "Duncan Jones tells us what really happened at the end of Source Code". io9. Archived from the original on August 13, 2011. Retrieved May 8, 2011. ^ "Practice Makes Perfect". Writers Guild of America. Archived from the original on October 15, 2011. Retrieved June 16, 2011. ^ Powers, Lindsay; Messina, Kim (April 1, 2010). "How Jake Gyllenhaal Wooed Duncan Jones to Direct 'Source Code'". The Hollywood Reporter. Retrieved June 6, 2011. ^ Richards, Dean (April 1, 2011). "Gyllenhaal says the 'Bean' could be metaphor for 'Source Code'". Chicago Tribune. Retrieved May 20, 2011. ^ "Source Code Filming Completes Today". ManMadeMovies. April 29, 2010. Retrieved November 22, 2010. ^ "Source Code filming in Ottawa's train station". Weirdland. January 13, 2010. ^ "Entertainment". Ottawa Sun. March 17, 2010. ^ "Exclusive: Duncan Jones on MOON, Source Code & Judge Dredd". ManMadeMovies. July 28, 2010. Retrieved November 22, 2010. ^ "Source Code – Company Credits". Internet Movie Database. ^ Warmoth, Brian (September 21, 2010). "'Source Code' Bringing Duncan Jones And Clint Mansell Back Together". MTV. Retrieved November 22, 2010. ^ "Duncan Jones". Twitter. December 15, 2010. Retrieved January 14, 2011. ^ "Source Code". AlloCiné. Retrieved October 28, 2011. ^ "Source Code Blu-ray (2011)". Amazon.com. Retrieved July 8, 2011. ^ "Source Code". Amazon.com. Retrieved July 8, 2011. ^ "Source Code Film & TV". Amazon.com. Retrieved July 8, 2011. ^ a b "Weekend Box Office Results for April 1-3, 2011". Box Office Mojo. Retrieved April 27, 2011. ^ "Source Code (2011) – Daily Box Office Results". Box Office Mojo. Retrieved April 27, 2011. ^ "Source Code Reviews". Metacritic. Retrieved August 18, 2011. ^ "'Source Code': A 'Groundhog Day' With Scientific Mumbo-Jumbo". TheWrap. Retrieved March 31, 2011. ^ "'Source Code' is a disaster 'Groundhog Day' with twists". Sign On San Diego. Retrieved March 31, 2011. ^ "Peter Travers: 'Source Code' is Confusing But Exciting". Rolling Stone. Retrieved March 31, 2011. ^ Holmes, Brent (April 6, 2011). "Source Code feels a lot like Deja Vu". Western Gazette. Retrieved June 10, 2014. ^ a b Charity, Tom (April 1, 2011). "'Source Code' a smart, original sci-fi thriller". CNN. Retrieved April 1, 2011. ^ "Arizona Republic: "Movies: 'Source Code' 4 Stars". AZ Central. March 30, 2011. ^ "Review: Source Code". Chicago Sun-Times. Retrieved March 31, 2011. ^ Turan, Kenneth (April 1, 2011). "Movie review: 'Source Code'". Los Angeles Times. Retrieved March 31, 2011. ^ Murray, Rebecca. "2011 SCREAM Awards List of Nominees". About.com. Retrieved September 15, 2011. ^ "2011 Nebula Awards Nominees Announced". A SFWA. Retrieved February 27, 2012. ^ "Hugo Nominees 2012". A SFWA. Retrieved April 10, 2012. ^ "10th Annual VES Awards". visual effects society. Retrieved December 31, 2017.